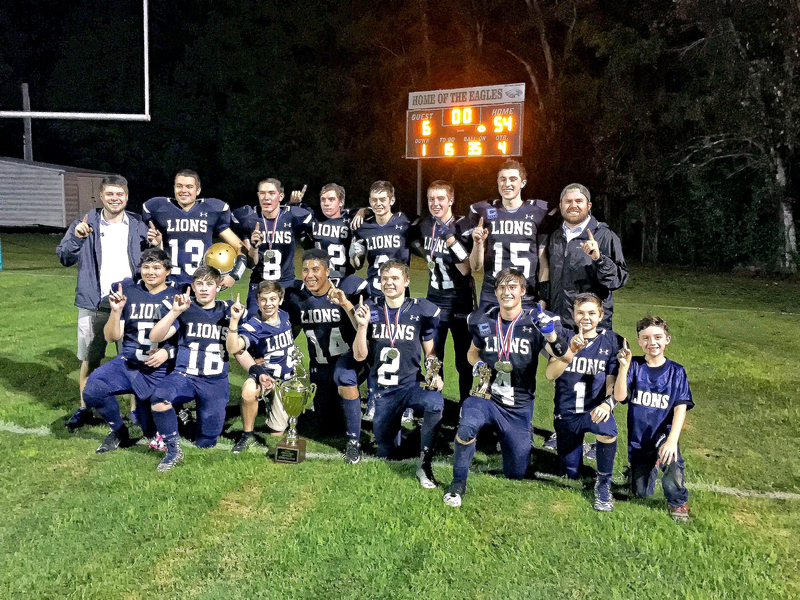 MILLBROOK — Friday night, the Cullman Christian School Lions defeated Victory Baptist School Eagles in the ACEAA Varsity Football State Championship 54-6. Some may see the win as revenge for the Lions after they were shutout in last year’s championship game to the Eagles, but instead of payback, it was like payday. CCS boys sports have been at the doorstep of championships in football and basketball since the school opened its doors in 2006. The school had varsity basketball in 2009, but football was not offered until 2012. With the team advancing to the playoffs in all six seasons of varsity basketball, and three out of four seasons in varsity football (the school was not allowed to compete in postseason play during its first season of football), being competitive in the ACEAA has not been a problem for the Lions. Rather, their problem has been cashing in on the championship hardware that, until Friday, had eluded them. In the ACEAA, the Lions play 6-man football, which sports a more open field for playmakers like Luke Barlow, Brett Perry, and Will Siegenthaler to operate. With wide-open spaces and Cantrell’s creative play-calling, the Lions put up massive numbers this year, outscoring opponents 463-69, according to Cantrell. “No one put up any more than 14 points on us,” Cantrell said looking back on his team’s perfect 10-0 season. It can be easy to bloviate about the majesty of winning a high school state championship, but for the CCS players, it wasn't earth-shattering. “I wasn’t awe-struck or anything,” Siegenthaler said about reports of his incredulity toward winning. “I wasn’t staring at the scoreboard, I was just looking at it,” he said. The players on this team don’t view the championship win as a watershed moment. Instead, some of the senior players would cheerfully announce how many games were left until the end of the season each week in the locker-room after the games. “I told the boys before the [state championship], ‘it’s your last one.’ And then they all cheered,” Cantrell laughed. There were reports of a dramatic and impassioned revenge-game for the Lions on Friday. But really, that’s just total hyperbole. There may have been aspects of perfection, redemption, and jubilation Friday night, but what was really going on was a group of lifelong friends having fun.